We already covered high roof cargo vans. Four vans with the highest roof were tested and reviewed, but today we explain extended cargo vans. Top roofs were tallest; these are the longest. Cargo vans with long wheelbase may not be popular as short counterparts but if you are serious about your business consider buying one for your fleet because of numerous benefits. Extended cargo vans for sale are slightly more expensive, but they offer much more cargo space. 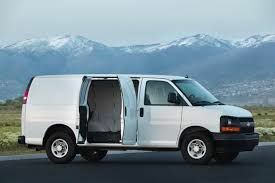 Read this article and learn what cargo van is available as extended (more than long wheelbase), cargo space dimensions, interior size and what models rule the US streets and highways. The first thing we need to point out is most long wheelbase cargo vans have a high roof. This makes them the biggest vans for work. Full-size cargo van in plus size to put it that way. No alteration or conversion can extend van length furthermore. Another thing you need to know is that long wheelbase is not the same as extended. Extended vans (as their name suggest) are stretched behind rear wheels and have few inches more in length. An example is Ford Transit Extended cargo van. Long wheelbase model has a length of 147.6 inches and overall length of 235.5 inches. Extended version (EL), on the other hand, has the same wheelbase length but the total length of a vehicle is 263.9 inches. That can make a huge difference for construction companies, and small businesses who deal with long pipes and ladders. Of course, pipes are not the only reason to go with an extended van. Van organization is much easier when you have so much space on the walls where you can add cargo van shelving. Drawers, bins, dividers, and storage systems to upfit your work rig to haul tools and accessories your job needs. The table below offers a side-by-side comparison for three most used extended vans in the US; Mercedes-Benz Sprinter, Ford Transit and RAM ProMaster. Our focus is on the six most important aspects of work vans: roof type, wheelbase, length, width, height and cargo space volume. Looking at the table, it's easy to find the winner in the full-size cargo van segment. Sprinter has the highest cargo space volume of 530.0 cu ft. At the same time it is the longest cargo van with a length of 177.2 inches. Same stands for wheelbase, with 170 inches distance between front and rear axles Sprinter has great driving and hauling capabilities. We don't want to praise just German manufacturer. Let's see what other van makers have to offer. It’s hard to say something new for best selling work ring in the US. Transit inherited “body on frame” Ford E Series in 2015 and instantly became the first choice for many fleet companies and tradesmen. The most prominent version of Ford Transit, 350 Extended has a maximum payload of 3,510 lbs. and towing capacity of 6,100 pounds. This van has no problem hauling 16-feet material (when open partition doors). Regardless van size, Transit moves very quickly, fast but it is comfortable at the same time. EcoBoost 3.5L V6 engine which uses two small turbochargers is a perfect fit for Transit 350 Extended cargo van. Equipped with 6-speed automatic transmission vehicle delivers 310HP and more than the decent torque of 400 lb.-ft. So, it is big and has the aerodynamics of a small house, but it goes really fast. Speed is fine but more critical is useful space behind the seats. With 487.2 cu ft of cargo interior extended Ford Transit can be turned into mobile workshop without any troubles. There is a lot of room for shelving, both on the driver and passenger side, and you'll still have a lot of room in the center. So, if you are a general constructor, this is the perfect vehicle for the job. With storage space of 462 cu ft, RAM 350 ProMaster Cargo van is in the second position in our list but it worth to consider in every way. ProMaster is the US version of very popular European cargo van made by Fiat, Ducato. Same as Italian sibling, ProMaster has front wheel drive, but engines are adjusted for America's roads and drivers. The largest version of RAM's full-size cargo van is 3500 High Roof 159WB EXT. Van has high roof and wheelbase of 159 inches and can tow 5,100 lbs. Maximum payload is 4,340 lbs. This van length is enough to accommodate 13-feet materials. The standard engine is refined Pentastar 3.6L V6 with 24 valve technologyPentastar. The same engine uses RAM 1500 pickup truck and some Chrysler minivans. The engine produces 280HP and 260-pound feet of torque. Transmission, 6-speed automatic, is very similar with one used in Chevy minivans, but it's altered for commercial use of a vehicle, with lower gear ratio. Interesting is heavy-duty suspension with rear sway bar that helps during heavy hauling. RAM engineers developed this suspension especially for commercial vehicles. Since it's a front wheel drive engine is placed under the hood, not under the dashboard. That means more space between the driver and co-driver seats. It has all the practical features that will make your drive super easy; there are a backup camera, rear bumper sensors, and big side mirrors. Van has a much lower center of gravity compared to main rivals; thus it doesn't roll as much. Talking about driving capability and handling, we shouldn't neglect incredibly small turning radius. You may forgot this old boy, but Ford E-350 Super Duty Extended Cargo Van was a bestseller for many years in the US. Today, we could say it's outdated with the body on frame design and 5.4L V8 engine with a weak fuel economy of 12 mpg in the city and 16 mpg on the highway. E-350 Super Duty has 4-speed automatic gearbox and rear wheel drive. Dimensions of cargo space are not impressive too. Cargo capacity is 237.8 Cu.Ft. Compare this figures with 2019 Ford Transit spec, and you'll get why E series cargo van became so rare. But there are some good things. One of them is the fantastic towing capacity of 9,200 Lbs. Maximum payload capacity of E-350 Super Duty Extended Cargo Van is 4,060 Lbs. But main advantage from this standpoint is a price. Used Ford E-350 Super Duty Extended, in good shape, usually former fleet vehicle, with maintenance record costs around $15,000. For full-size commercial van equipped with a rear camera, AM/FM stereo, air condition, power windows, and remote keyless entry this is a good deal. Winner and work van with the most useful space is Mercedes-Benz Sprinter 3500 170WB Extended Cargo van. We already mentioned cargo space dimensions and here is info regarding powertrain and engine. Sprinter uses 6-cylinder, 3.0L diesel engine, with one turbocharger. The engine transmits power over 5-speed automatic gearbox and is capable of delivering 188HP and 325 lb-ft of torque. Compared to ProMaster and Transit this engine may seem laggard, but this is the only engine Mercedes offers for Sprinter Cargo van. Diesel engines tend to increase the price of a vehicle, but it will pay off thru excellent fuel economy. Maximum payload capacity is 4934 lbs. If your job requires to tow trailer, know that maximum towing capacity is 5000 lbs. Although 2017 Mercedes-Benz Sprinter Extended Cargo Van has the largest room for cargo, it has the highest price too. If you like Sprinter dimensions, handling, look and practicality may be the best option is to look for used one. Used Sprinter 3500 170WB Extended Cargo, three or four years old, with 30K miles on odometer can be yours for $45,000. Smaller, but also an extended version, 2500, with the same wheelbase of 170 inches is much cheaper. Models in exceptional condition cost up to $25,000. That is a considerable saving compared to the price of a new vehicle. This also may seem expensive but consider that you get premium commercial van equipped with latest safety technology, diesel engine with fantastic fuel efficiency and proven German quality. If you live in Houston area, it's easy to locate pre-owned extended van for sale at fantastic price. Stop by Fleetworks of Houston, at 4815 Katy Freeway and our sales manager will recommend the van that is long enough to bring and haul all your tools and equipment. Our parking lot is full of used ProMasters, Sprinters, and Transits with low mileage and perfect maintenance record. Plus, we offer a variety of financial plans to help buy the vehicle within your budget.